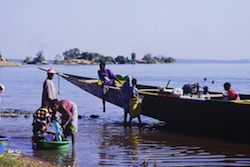 BAMAKO, Oct 31 2011 (IPS) - Several major new dams are being constructed on the Niger River. It’s a positive sign of growing investment in agriculture and energy, but it also has some observers worried. The new dams not only raise ecological concerns, but are also provoking difficult negotiations over equitably sharing the resources of a river basin that extends over two million square kilometres. “There are nine countries in the Niger basin, but their interests are divergent. There are certain countries – such as Mali and Niger – which don’t want any dams constructed upstream,” said Bi Tozan N’Guessan, an expert at the Côte d’Ivoire Water Ministry. The Niger River Basin Authority is the coordinating body for the 4,200 kilometre-long river, bringing together the governments of Guinea, Côte d’Ivoire, Mali, Burkina Faso, Niger, Benin, Chad, Cameroon and Nigeria. Since 2008, the Authority has authorised the construction of three multi-purpose dams: at Fomi in Guinea, at Taoussa in Mali, and at Kandjadji in Niger. These new dams will provide benefits that spill across borders. “The Taoussa dam will provide electricity to Burkina Faso and Niger, for example,” says Ferdinand Bélé Gohou, president of a Guinea- based non-governmental organisation called West Africa Mountains and Forests. The Fomi dam is intended principally for hydroelectric power, but its reservoir will create opportunities for fishing, say its supporters. Areas around the reservoir could prove suitable for raising cattle and other types of livestock as well as for agriculture. The new body of water could also provide habitat for aquatic birds. According to Gohou, other countries in the basin will benefit from the Fomi dam’s capacity to be a regulator of water levels in the Niger at different times of the year. “This is important for agriculture because in the countries located downstream, it will allow for irrigation during the dry season,” he told IPS. But ecologists fear new dams will have damaging effects downstream, particularly for the more than a million people who live in the Inner Niger Delta in Mali. The country’s colonial-era Markala dam – which feeds large-scale irrigation projects – as well as the newer Sélingué hydroelectric dam, completed in 1980, have caused the water level in this fertile and ecologically-diverse wetland to fall by more than 20 centimetres, shrinking the annually-flooded area by 900 square kilometres. “Water levels in the Inner Niger Delta will drop by another 45 cm if the Fomi dam is built,” says a 2010 study by the Netherlands-based NGO Wetlands International, titled “Impact of Dams on the People of Mali”. Navigation of the river would also be constrained by shorter periods when the water was deep enough for large boats. But the report is also careful to point out that the Sélingué and Markala dams have had strongly positive impacts in their immediate surroundings. Mali itself is planning major new dams. One project at Djenné will double as a 316 metre-long bridge across the Bani, a major tributary of the Niger. Speaking at the 38 million dollar dam’s ground-breaking ceremony in September, Mali’s agriculture minister, Agatam Ag Alhassane, told journalists that the dam will not only generate electricity for surrounding areas, but will boost production of rice and vegetables, as well as support fishing and livestock activities. Some 45,000 direct and indirect jobs are also expected to be created. Another proposed project, a multi-purpose dam at Taoussa, will have a 25 MW generating station and could eventually provide irrigation for nearly 140,000 hectares; according to a Malian government study, this dam will also reduce the annual productive potential of energy-starved Nigeria’s Kainji dam by 200 gigawatt/hours per year, nearly nine percent of its current output. Across West Africa, urgent problems of food security and rural livelihoods demand answers in the form of investment and infrastructure. Sustainable solutions that involve the region’s largest river will require careful, basin-wide assessment of the costs and benefits.